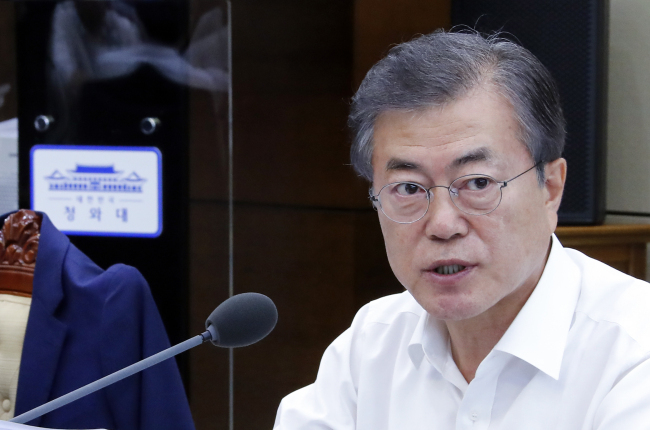 Cheong Wa Dae said Tuesday the presidential office had not realized the seriousness of a martial law document when it was first reported last month, amid the escalating controversy over the defense minister and presidential aides’ handling of the case. In a meeting with reporters, a senior presidential official said Cheong Wa Dae officials “gradually” began to realize the political significance of the document, which contains a plan to consider declaring martial law at the time of massive protests against former President Park Geun-hye. The remark came as questions arose over why Defense Minister Song Yong-moo and presidential aides did not fully address the issue until after the document was revealed by the ruling Democratic Party of Korea’s Rep. Rhee Chol-hee on July 5. “From the government’s perspective, our decision entails political and legal responsibility. ... So think it is fair to say that (Cheong Wa Dae) needs time to look into the issue in a serious manner,” the official added. The official said the martial law document was submitted to the presidential office on June 28 by the Ministry of National Defense. Song had brought up the martial law allegation to the presidential aides two months earlier, but it was not an official briefing, the official added. The defense minister was suspected of holding back the investigation into the allegation until President Moon Jae-in ordered a thorough probe last week. The Defense Ministry said Song was briefed about the document by Defense Security Commander Gen. Lee Suk-goo on March 16. Song said Monday that his decision not to disclose the martial law document was largely made out of “political consideration,” as South Korea was preparing for important political events such as an inter-Korean summit and local elections, which occurred in April and June, respectively. “I believed it was important to create a positive atmosphere for a successful inter-Korean summit. ... After taking into account possible political consequences of such a revelation, I decided it would be better to withhold the document,” Song said. In the document titled “Wartime Martial Law and Joint Action Plan,” the Defense Security Command said it could consider declaring martial law in the event that anti-Park protesters forced their way into Cheong Wa Dae. While former Defense Minister Han Min-koo maintained it was a contingency plan in the event that the protesters forced their way into the presidential office, the controversy shows no sign of abating as some lawmakers and activists have compared the document to a military coup attempt.